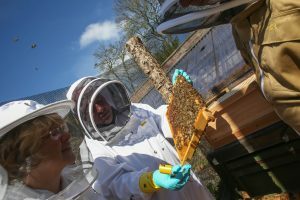 The “Buzz” is our apiary sessions update. Hopefully the updates will give you some tips and hints about what we can be looking at with our own apiaries. 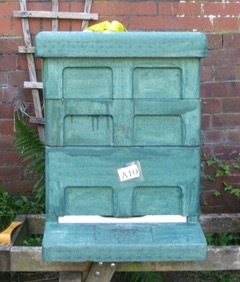 The open apiary sessions have now finished for this year. We will let you know when they are up and running again next Spring 2019. It has been two months since my last report but that doesn’t mean nothing’s been happening in the Apiary. The bees don’t sleep during the winter, so we need to keep an eye on what’s happening with the colonies and as we don’t want to open up the hives, this has to be done by observing from the outside. On really cold days, the bees are clustered together for warmth. If you saw the BBC Dynasties programme about the Emperor penguin, the way they huddle against the icy winds is very similar to what honey bees do to keep warm. Bees take it in turn to be on the outside of the cluster. It’s very similar to their behaviour when they swarm and cluster on a tree branch where they might stay for days. We’ve been checking the weight of the hives regularly to see if it’s staying roughly constant, indicating that they have enough food and we’ve been replacing the fondant with a new pack when it’s running low. The bees seemed to have been able to forecast the recent “heatwave” and started foraging as soon as the temperature started to rise. We had a large delivery of bedding plants at Offshoots and the bees quickly became aware of this and took their fill of nectar and pollen. But, even during this warm spell, the night temperature dropped close to zero, so the colonies would be clustering again for warmth. The fact that they’re bringing in pollen signals that there is young brood to be fed and the queens have started laying. It’s very tempting, at this time of year, when the daytime temperature is unseasonably high, to open up the hive to confirm that there’s young brood in there. But if you take a look in the hive you will break the propolis seal the bees have put in place to keep drafts out and the warmth they generate in. The drop in temperature, as you let all the hot air out, has to be replaced (to keep the brood warm) by the bees consuming yet more of their stores, when they may be quite low, and the number of mouths to feed is on the increase. This is a luxury they can’t afford and you could push them into starvation. Last year the unseasonal warm and cold weather fluctuations caused some colonies to over extend themselves. Then the Beast from the East returned and some beekeepers lost colonies, the bee work force appeared to have been torn between covering the brood, to keep it warm, and seeking out the stores and going into cluster. So, my advice at the moment would be not to let your curiosity get the better of you. Unless you really think something’s wrong and you need to investigate, hold off opening the hives for a while longer. Content yourselves with seeing the foragers out bringing in supplies. Take the Varroa boards out and clean them after looking at them to gauge the colony’s position in the hive and the size of the area of activity. We have managed to extract some honey from the hives this year, the first time it’s been done at Offshoots for a while. It’s now on sale at Offshoots but it’s going fast. We’ve a lot of old frames, so over the coming weeks, we’re going to be stripping any wax out of these old frames and either exchanging it for new foundation or selling it, if it’s clean enough to be used in candles and other wax products. That’s the Buzz for now . . .